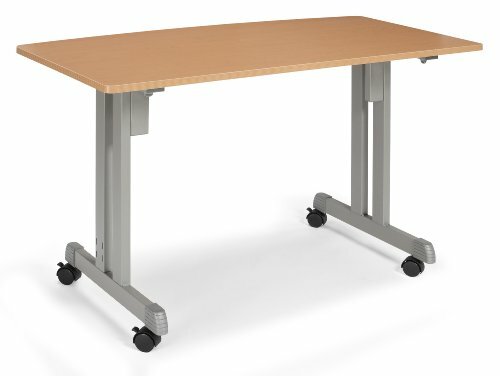 OFM 55111-MPL-OFM 55111 modular table offers a multi-purpose solution perfect for office, learning, or training spaces in a sleek, modern style. Put multiple tables together for a Group learning/working environment. The 24" x 48" thermo fused melamine top features self edge banding for a finished look. The industrial strength steel frame is powder coated in a scratch resistant finish and can hold up to heavy duty use. Best of all, assembly is a breeze - innovative snap-and-lock technology means no tools are required for assembly. This table includes leveling guides for added stability (optional casters available, sold separately). measures 27.5" high. This 55111-MPL-OFM meets or exceeds industry standards for safety and durability, and is backed by OFM limited lifetime warranty.